CIY 1.0 – hot swappable switches, change it yourself, make customizing your favorite mechanical switches so easy. DIU RGB – DIY interesting & useful RGB backlit effect, fully user-defined. Inexpensive price – hope to let people who love it can afford it. 1. As major 60% keyboard on the market, they are not a smart keyboard at all, because they nearly can’t be customized. 2. For such poker layout Poker 2, Pok3r kind of 60% keyboard, custom is messy, because they are without driver software, only have hardware programming. 3. If you want to custom your personality keyboard, such as GH60, then customization is a very cumbersome work. 2. On aftermarket, replacing the poker layout mechanical keyboard’s keycaps is easy. poker 1 keyboard: can’t be programmable. poker 2 keyboard: Without full RGB backlit. Its programmability is weak. 1. The programmability is higher than poker 2, but because of its hardware programming, it is much cumbersome to program and control RGB LED light effects. 2. Only has metal case and Cherry MX switches edition. It’s more expensive, and users have no more choices for different mechanical switches, custom kits, PCB and other parts. 3. On the present market, all poker keyboard without hot swappable switches, switches customization is not easy. Poker layout, but it’s a more smarter, customizable, useful, interesting, and much inexpensive poker keyboard. More people can afford, use and play it. 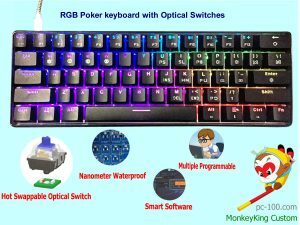 SmartMonkey: 60% multiple layers’ programmable mechanical keyboard, with smart driver software, full RGB backlit, hot-swappable switches, poker layout. Especially suitable for programmer. Portable for travell, it’s easy to take on the go. Hot-swappable switches ( CIY 1.0)—custom your favorite MX-based mechanical switches by yourself. Ever wonder what Gateron Blues felt like? Or what is the craze behind the Cherry MX clears? Want to use Gateron Reds for your WASD, but Gateron Blacks for all your other keys? 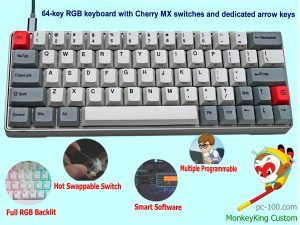 With the SmartMokey keyboard, you no longer have to purchase an entire new keyboard, or disassemble and solder your switches – you can simply & easily remove and install any MX-based switch ( such as Cherry, Gateron, and Kailh branded switches.) without any soldering, just like a keycap, and mix/match to test out and use any combination of switches you desire. Such as dovrak mechanical keyboard, workman keyboard, Colemak keyboard, HHKB layout keyboard, Mac keyboard layout, any layout you like can be configurated. When the programmer do programming, build some macros for programming, the working efficiency will be improved a lot. Take performance and lighting settings with you. Convenient for travelling. The Gateron switch is recognized as the most closest to the cherry mx switch’ feeling among Chinese brand mechanical switches. Gateron switch’s design has been the beginning of the cherry switch as the benchmark and the standard. 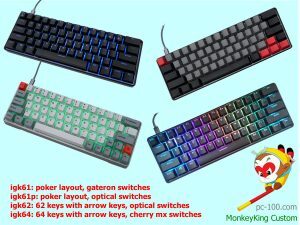 As black switch and red switch, the main difference between Gateron and Cherry is the spring, their pressures are not completely same as cherry’s. Brown switch of the typing feeling is better than the cherry brow switch’s. Gateron blue switch compared to the cherry blue switch is louder and clearer (feel also neat many). Gateron blue switch’s type feeling is crisp, more clear and bright. 1. 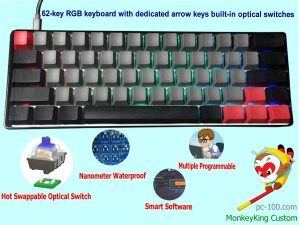 Multiple programmable and interesting RGB, especially suitable for computer programmer, coders, engineers, technicians, a perfect professional programmer keyboard, code keyboard, engineering keyboard. 2. Hot swappable switches, suitable for those mechanical keyboard fans who can try all kinds of MX-based switches freely. 3. Minimalist appearance and plenty inside, fit for those low profile and connotative persons. 4. 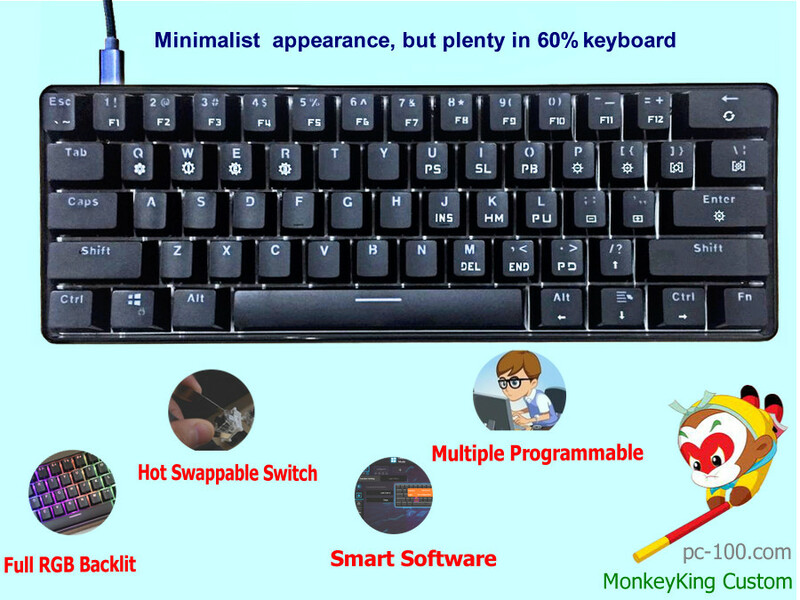 Affordable 60% smart mechanical keyboard, let people who love it can own it easily.